At 8:15 every morning when I walk down Granville Street to Broadway to take the bus to work, the ladies in the kitchen at Vij’s have already been at work for awhile, and the neighbourhood smells like onions frying in butter, and garlic and ginger, and slow-simmering curries warmed with cumin and cinnamon and pepper that make me want to quit my job and my apartment to spend my days hovering over their shoulders, taking deep breaths and sneaking tastes right from the pan. The aroma hangs in the air over three blocks, and is only stopped by the grease stink from the McDonalds on Broadway; if no one there was frying fries (or, at that hour, Egg McMuffins), I think the smell from Vij’s would go on forever. But this is not a love letter to Vij’s, because Vij does not need that sort of thing, especially not from me. And besides, I can’t afford to eat there all that often, and I have reached the age where don’t care how good something is, I’d mostly prefer to not have to wait in lines. And for Indian food the way (and price) I think it should be, there are very few places in the city that meet my expectations; I know to go to the suburbs for the good stuff. More often than not, though, it’s not a special dish I’m after. The thing about those spices and that smell in the air is that they are suggestive of a whole range of flavours. The smell of garam masala is not specific to a dish, at least to me, but is suggestive more of a feeling, which is perhaps why I crave it so strongly during these long dark months. 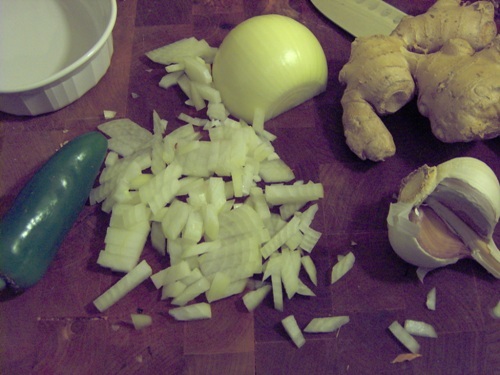 I like the warmth a warm bowl of curry brings; I like the smell of it in my apartment, the way the aroma assembles itself in layers, beginning with garlic and ginger and finishing with coconut, cilantro, or a squeeze of fresh lime. I like the way that turmeric turns a pot of onions golden, the way that tomato colours it orange, and the way herbs at the very end brighten as they touch the heat of the dish. Curry makes me happy. And so, after crossing 11th Avenue this morning and smelling Vij’s ginger and onions and garlic and feeling so very tired for a Thursday, I resolved to come home and throw together something equal parts nourishing and delicious. That I spent the day teetering and clomping around in too-high heels and encased in control-top pantyhose and a dress with no stretch fibres made the satisfaction of sitting down to a hot, saucy dinner all the greater. What follows is a recipe for a curry that makes the most of your pantry staples and any butternut squash you might have been hording for however long. It’s spicy but also sweet, and a glorious colour that’s sure to liven up a dull grey day. In a large pan over medium-high heat, warm oil and add onion, jalapeño pepper, garlic, and ginger. Sauté until onions are translucent and jalapeño pepper has brightened in colour. Add garam masala, red pepper flakes, fenugreek, turmeric, and pepper. Stir to coat onion mixture thoroughly, and cook for two minutes. Add diced squash and chickpeas, stir, then add coconut milk, tomatoes, and lime zest and juice. 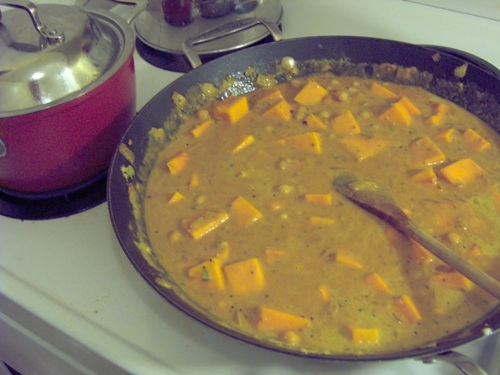 Stir to coat squash in curry mixture, then reduce to medium heat, cover, and let cook for 15 to 20 minutes, until squash has softenened. Stir occasionally. Once squash has softened, taste and adjust seasonings as needed. Add scallions and cilantro, and serve over rice with an additional sprinkling of cilantro for colour. I apologize again for the unusually poor photos; Mom and Dad have come to the rescue with a belated Christmas present in camera form, but it doesn’t arrive until tomorrow. After then, prepare to be amazed. Also, don’t forget to vote for Well fed, flat broke in the Canadian Food Blog Awards! < Previous Vegetarian borscht with beets and red cabbage. Next > Winter in the garden. WANT! Also: finally a use for those fenugreek seeds that I had no idea what to do with. Yum, this looks delicious and I love how you describe your love of curry. I was just wondering last night what to do with that butternut squash I bought that has been living in a basket on my fridge for a week. Thanks, Em! oh my word that looks amazing! i just made curry as well to comfort me and sooth my bloated holiday belly:) more veggies please!!! less cheese. boo. Yum yum yum yum. That looks absolutely delicious. While your garlic grows, you can snip off just tops of the sprouting greens now and then. They have the most lovely, light garlic flavor and you’ll still have the bulbs to harvest later on. Michelle: I hope you try it! I’ve been using fenugreek seeds with my chard lately and it’s very nice. Jake: Use it! I had mine a lot longer – I think I bought in October. So, you know, if you don’t use it for whatever reason it’s nice to know they last. Sharon: Thanks! I know. We’ve been eating vegetables by the bowlful these days, trying to undo the holiday damage. Pants = so tight! Sue: Thanks for the tip! I’ll check back in awhile and see if there are any sprouted treats for me. Good to know! 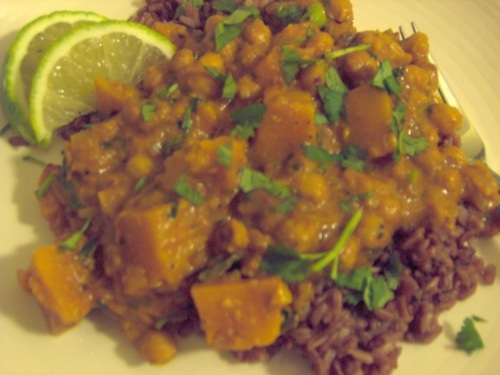 I need to make this asap, my families going through a butternut squash phase and we always love a good chickpea dish! In fact we buy chickpeas in bulk as we eat so much!! 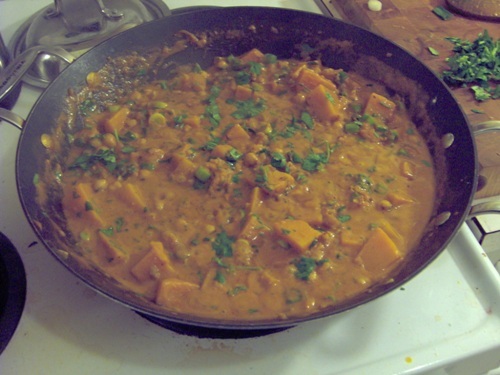 I made this last night with acorn squash instead (the fiance does not like butternut). Despite suffering a bad peeling injury – peeling acorn squash = sucky – it turned out very very delicious. Thank you! Ohnoes! I’ve never peeled an acorn squash – I imagine that tackling the ridges with a sharp blade would be treacherous! But I’m glad you liked it, injuries notwithstanding. I’m currently sporting a maimed thumb on behalf of a loaf of gingerbread, so I feel your pain.